What is the best iPhone app to view CCTV cameras remotely over the Internet? This is a very common question that the support and sales engineers at CCTV Camera Pros receive. With the exploding growth of iPhone usage worldwide, it is no surprise that users with video surveillance systems want to view security cameras installed in their home and businesses from their iPhone. I original wrote this article in May of 2011. I am updating it today, 7/28/2014, with my latest observations, opinions, and updates. My name is Mike Haldas and I am the co-founder and managing partner of CCTV Camera Pros. I started CCTV Camera Pros with my business partner is May of 2006 and ever since the advent of iPhone, I have constantly tested the latest DVRs, cameras, and video servers from leading manufacturers worldwide to find the very best ones for CCTV Camera Pros to supply to customers. 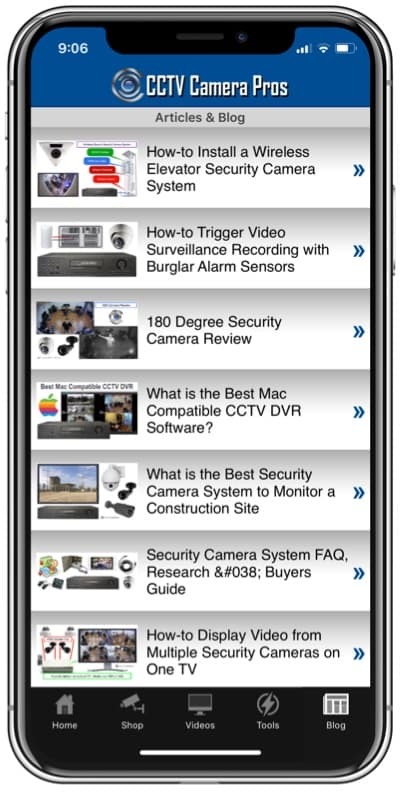 My originally review included two iOS apps, the MobileCMS app for iDVR-E model CCTV DVRs and the GV-Eye app for Geovision surveillance systems. I am adding one additional app to this updated review: the iDVR-PRO Viewer App for iOS. This app is used with iDVR-PRO CCTV / HD security camera DVRs. 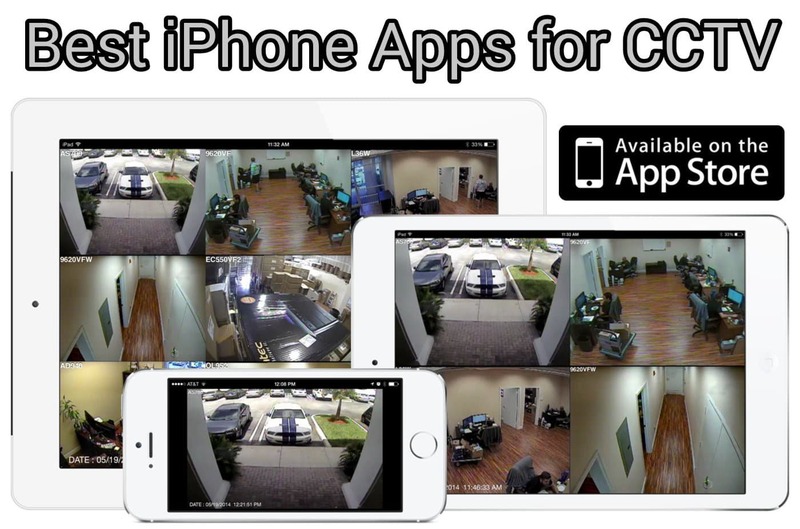 Here are three of the best iPhone apps and surveillance solutions that CCTV Camera Pros recommends for viewing CCTV cameras. The first two solutions use an Internet enabled stand alone DVR and the third uses an add-on device called a network video server that enables Internet access for CCTV cameras (with or without the use of a DVR). The latest iDVR-PRO DVRs use the latest H.264 video compression and support the following security camera types: analog CCTV, AHD CCTV cameras (720p and 1080p), and 1080p HD-TVI security cameras. The iOS app used to access these DVRs is truly outstanding and the reason that I needed to update this blog post. iDVR-PRO HD surveillance systems are my top pick for iOS users and the latest version of the app supports motion detection push notifications. The app runs in landscape mode and lets users switch the view between single, 4 camera, 9 camera, and 16 camera grid views. When the DVR is connected to high resolution 960H CCTV cameras, there is a high quality setting in the app so that the video stream is in HD mode. This animated GIF shows the app being switch between single and multiple camera views. It also shows how the menu system can be make visible / hidden by tapping on the screen. You can see how clear the video is by watching the below video. Be sure to click on the setting button (gear icon in the lower right) and set the video resolution to HD 1080p HD when you watch. In addition to the excellent live remote viewing quality, users can also search and playback video footage that has been recorded to the DVR’s hard drive. The app makes this extremely simple to do. You can learn more about viewing cameras remotely from iOS with the iDVR-PRO Viewer app here. In addition the the excellent support for iOS devices, these DVRs are also Mac compatible. Users can access iDVR-PROs from a web browser or the included client application on Macintosh. A free DVR viewer app for Android mobile is also available. These Please visit this page to learn more about iDVR-PRO CCTV DVRs and to request a demo login. The iDVR is another one of the best CCTV DVRs in its price range that has the type of high end quality and remote viewing support that it does. The iDVR is exclusively sold by CCTV Camera Pros and is available in 4, 8, and 16 channel models. There is a free mobile CMS iPhone app that is compatible with the iDVR (iDVR-E and iDVR-RT16 models – these are a different interface than the iDVR-PRO reviewed above) that allows users to view their cameras remotely in single screen view as well as 4, 8, and 16 camera view grids on one screen. The quality of this app is among the best that we have seen for a stand alone recorder. Although the overall quality of the app is not quite as outstanding as the iDVR-PRO, there is one feature in the app that is very significant and makes this app stand apart from most others. The Mobile CMS app for iDVR-E has awesome support for push notifications. Watch the below video to see this feature in action. 2018 update: the above iDVR-PRO viewer app now also supports push notifications. The app connects to the DVR’s H.264 video stream which enables very fast response time even over slower Internet connections. In addition to supporting remote view for iPhone, the app also works in 2x display mode for iPad and an app is also available for Android and Blackberry smart phones. If you want to view from a laptop or desktop computer, both Windows and Mac computers are supported. The iDVR pricing currently starts at $599 for the 4 channel model. Click here to view an image gallery and demonstration videos of he remote iPhone viewing capability of the iDVR. Click here to download the mobile CMS iPhone app for iDVR. If you already have a DVR that you do not want to replace but it is missing support for iPhone access, then a Geovision GV-VS04H IP video server and the GV-Eye iPhone app may be the perfect solution for you. The GV-VS04H allows you to connect up to 4 CCTV cameras to it. The video server enables access to your cameras from the iPhone using the free GV-Eye app. Users can easily split the video signals from each of their cameras between their existing DVR and the Geovision video server. Click here to view video server installation options. 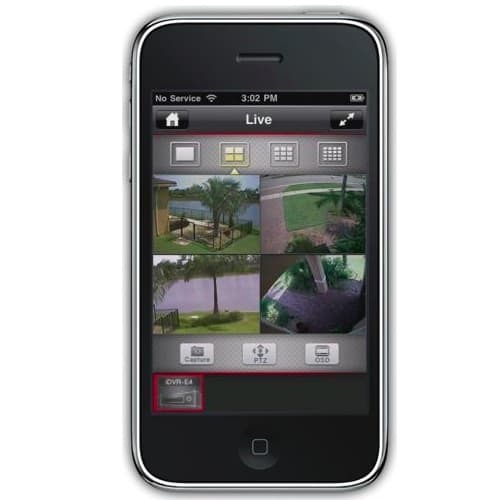 The GV-Eye iPhone app supports viewing one or 4 cameras per screen and also supports connecting to multiple video servers and Geovision IP cameras. This allows users to view multiple locations from the same app session. Click here to watch a video demonstration of the GV-Eye App connecting to a Geovision video server. Click here to download the GV-Eye iPhone app. If you prefer IP cameras and and NVR instead of analog cameras and DVRs, we highly recommend Zavio IP cameras and Zavio network video recorders. The iPhone app that is available to connect to Zavio NVRs supports excellent live camera viewing and remote playback (both in HD video quality). The app also supports digital PTZ functions and push message alerts based on motion detection and other types of alarm events that can be configured on the NVR. Watch the below video to see the live camera viewing capability of the app and click here to learn more. About the Author This article was written by Mike Haldas, co-founder and managing partner at CCTV Camera Pros. Mike is a subject matter expert in the area of video surveillance and mobile software applications. Before starting CCTV Camera Pros with business partner Greg Bond, Mike worked as an Internet software engineer and product manager. Mike has a passion for finding and testing the best video surveillance equipment and software applications available so that CCTV Camera Pros can provide them to their customers. 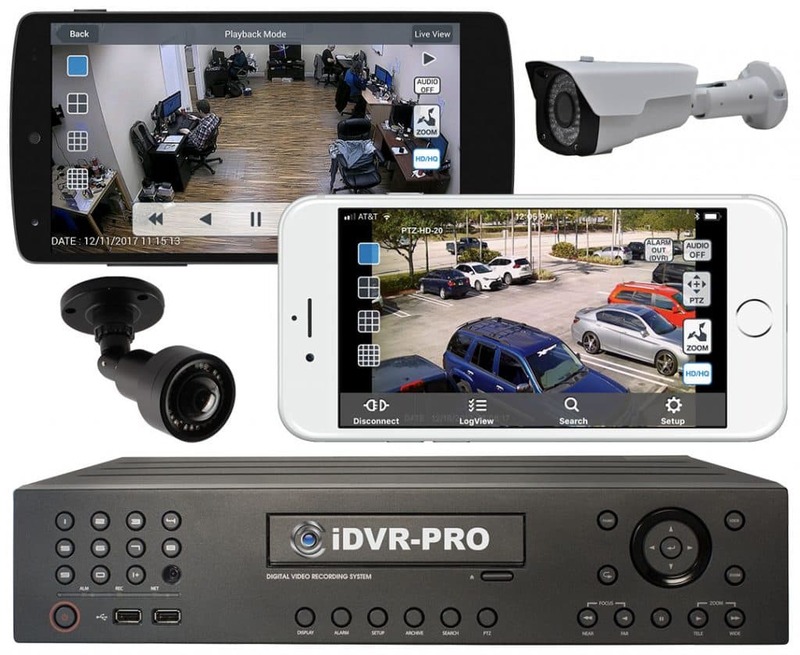 If you have questions about this article or anything related to video surveillance systems and mobile viewer apps, Mike can be contacted at mike@cctvcamerapros.net.